Are you interested in learning how to become a Gunsmith? 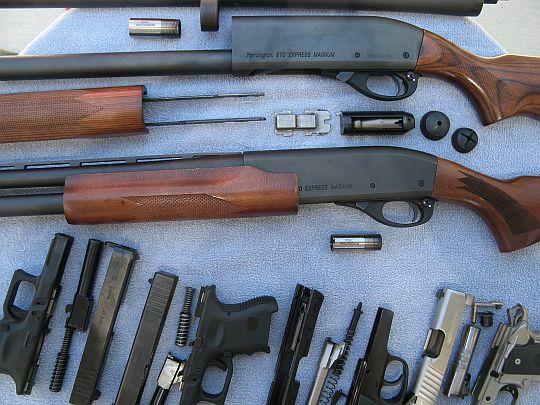 Gunsmiths are highly skilled craftspersons who develop, fabricate, restore, or repair guns. Gunsmiths usually work as specialists or generally practitioners with clients who are hunters, collectors, firearm dealers, and other individuals qualified to own firearms. Gunsmiths often work within self owned businesses, gun shops, private shooting ranges, sporting goods stores, or within major firearm dealer organizations. Gunsmiths must possess the skills required to perform occupational duties, like refined hand/eye coordination, grip, and keen sight, as well the educational and work experiences necessary to qualify for employment. Individuals interested in becoming a gunsmith may prepare before completing their high school diploma or G.E.D. High school students may complete courses within physical education, mathematics, English, business communications, and psychology to prepare for their future careers. Additionally, many high school students may complete gun safety courses, participate in shooting clubs, and/or hunt. High school graduates often advance to certificate programs, internships, or degree programs to expand education and training. Many trade or vocational schools offer one year certificate programs to individuals seeking the knowledge to qualify as a gunsmith. Certificate programs often include courses like: identifying and evaluating firearms, ammunition and ballistics, gunsmith tools, metalwork, hand and power tools, correcting accuracy problems, routine maintenance, level action rifles, semiautomatic rimfire rifles, bolt action rifles, installing scopes, triggers, testing repairs safely, installing a recoil pad, ammunition, single and double action revolvers, semiautomatic pistols, and installing a recoil pad. Individuals who complete certification programs often advance to entry level employment or continue studies within apprenticeship or degree programs. An apprenticeship in gunsmithing offers students the ability to learn within hands on environments to gain experience and acquire skills necessary for employment. The Association of Gunsmiths and Related Trades (TAOGART) offers candidates with a high school diploma or G.E.D. and who are over the age of 16 the ability to master basic tasks and gradually advance to more complex projects. Apprenticeship programs generally feature instruction based in 8,000 training hours covering the safe and proper ways to operate machinery, customize firearms, disassemble and reassemble firearms, and design firearms. Apprenticeship programs also allow students to learn specialized skills, like polishing and bluing, checkering, and pistol,revolver, or rifle smithing. Individuals who complete apprenticeships may advance to employment or continue studies within formal degree programs. An associate degree in gunsmithing offers students the ability to specialize training, refine skills, and advance professional goals. Courses include: apprenticeship gunsmithing, journeyman gunsmithing, professional gunsmithing, master gunsmithing, workplace dynamics, principles of management, entrepreneurship, owning and operating small businesses, Wordperfect, Microsoft Word, Basic Engraving, advanced gunsmithing practicum, gunsmithing internship, and independent study gunsmithing. Graduates who complete associate degree programs in gunsmithing advance to employment or continue studies within a related field as higher degree programs for gunsmiths do not exist. Experienced gunsmiths often continue education, gain licensure, or maintain certification through programs offered by the Association of Gunsmiths and Related Trades (TAOGART). The organization offers numerous educational opportunities, specialized training, and networking contacts with the coordination of international professional gunsmiths, stock and barrel makers, and engravers. Now that you know more about how to become a Gunsmith, you’re ready to take the next step towards the rewarding career you’ve always wanted.